During the first stage our girls assisted Emilie in the intermediate sprints securing bonus seconds for the overall. The stage finished in a bunch sprint and altough not finishing in the top ten Emilie held on to a good 5th place in the overall with her bonus seconds. On the second stage there were a lot of crosswinds and already early our girls got to the front to break up the peloton. Wind, breakaways, teams missing out and closing gaps sums up the race. Eventually it came down to a bunch sprint in a reduced peloton and after a good team effort Emilie sprinted to a great 4th place, a tire width from podium. Although several attacks, also the last stage ended in a bunch sprint and Ting Ying Huang (Taiwan) could celebrate her second victory of the week. Chloe Hosking (Wiggle High5) brought home the overall victory with Huang in second while Leah Kirchmann (Liv Plantur) completed the podium. Emilie finished as our best rider in a strong 8th place. 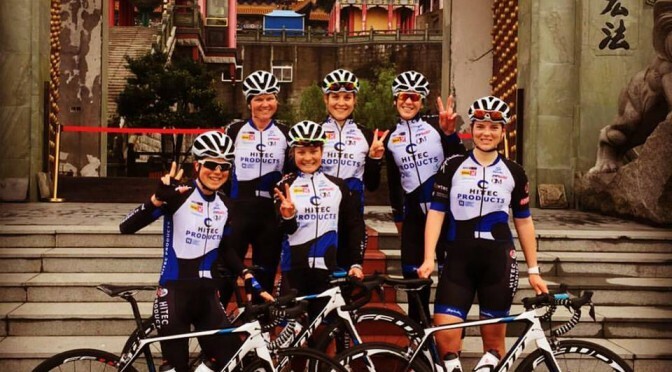 Already Wednesday the girls start in their next three day stage race, the Tour of Zhoushan Island. Our team in China: Thea Thorsen, Emilie Moberg, Simona Frapporti, Tone Hatteland Lima, Julie Leth & Ingrid Lorvik.